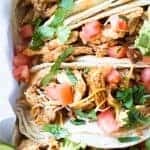 30 Minute Chicken Tacos! 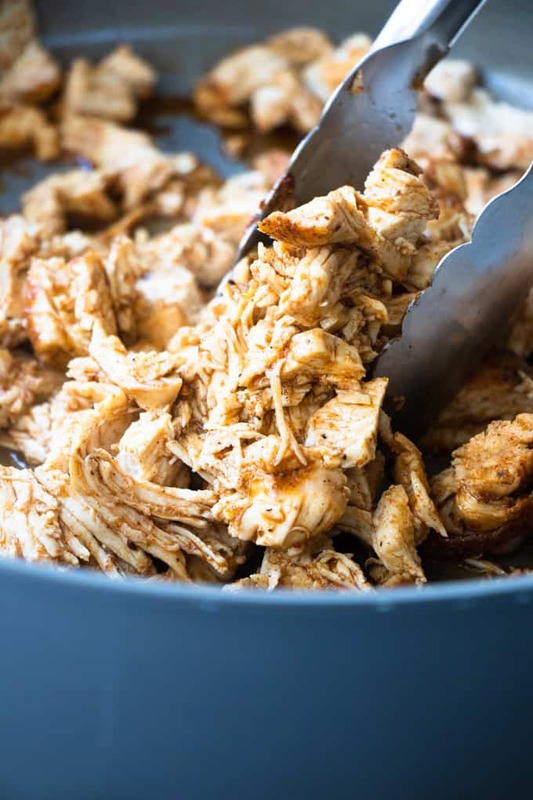 This is the EASIEST, most flavorful shredded chicken taco recipe! Perfect for a weeknight dinner, or busy day. 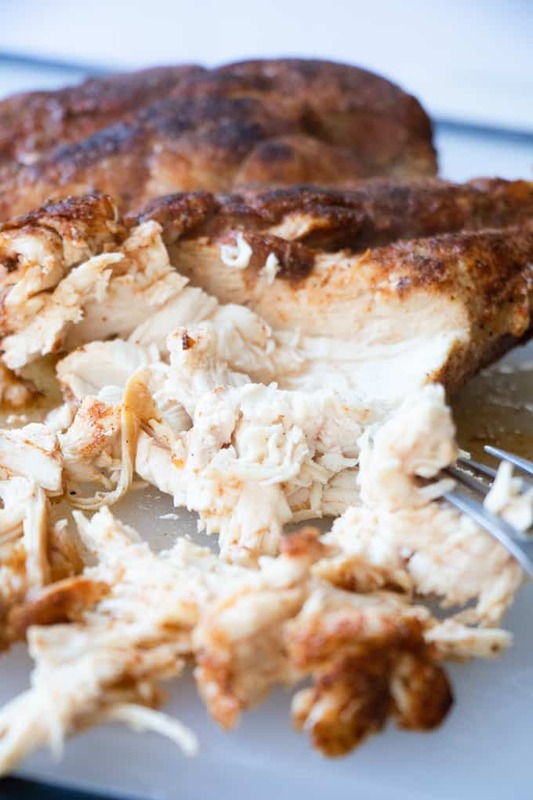 Only 30 minutes is needed to cook up and shred the chicken. I’m pretty sure my love for tacos is apparent on this site. So it’s about time I finally created a chicken taco recipe! 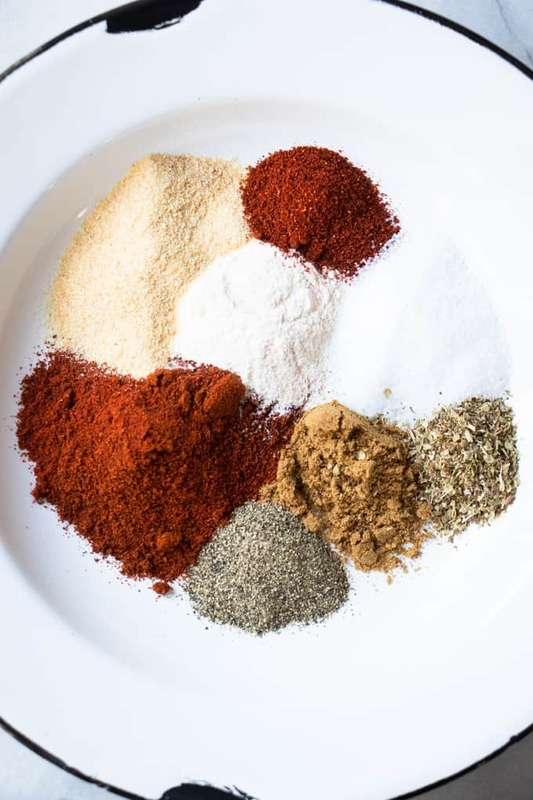 The base for this recipe is the chicken taco seasoning. 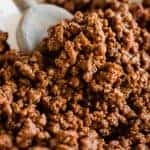 Which is very similar to my regular beef taco seasoning. But I upped the spice, because I feel the chicken needs more flavor, there is nothing worse than bland chicken. So not only are we using chili powder, but a bit of paprika also. 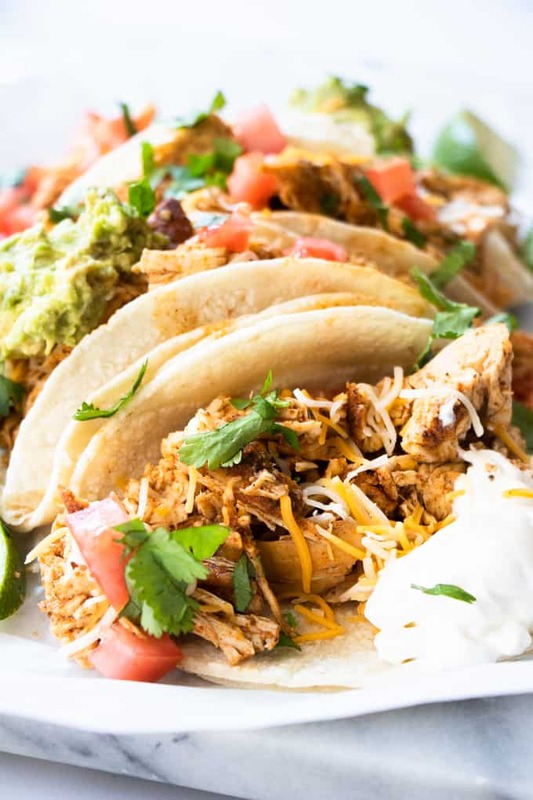 These chicken tacos come together so quick and easy. They are perfect for a weeknight dinner. Then coat the chicken with the seasoning. Sear the chicken in a large skillet with some olive oil. Pour in a cup of low or no sodium chicken broth and cover the skillet. This will poach the chicken and cook it, making it easy for us to shred it. It’s very similar to the method I use when I need to shred chicken for any other recipe. Once the chicken is cooked, shred it, stir it back into the sauce leftover in the skillet to thoroughly coat the chicken with flavor. And you are all set to make the BEST EVER Chicken Tacos! Does slow cooking work better with your schedule? 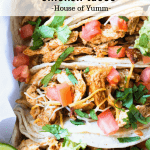 You can absolutely make this chicken taco recipe in your slow cooker (affiliate link) and it is just as easy. We will follow the same basic steps. However, add it to the slow cooker instead of using a skillet on the stovetop! 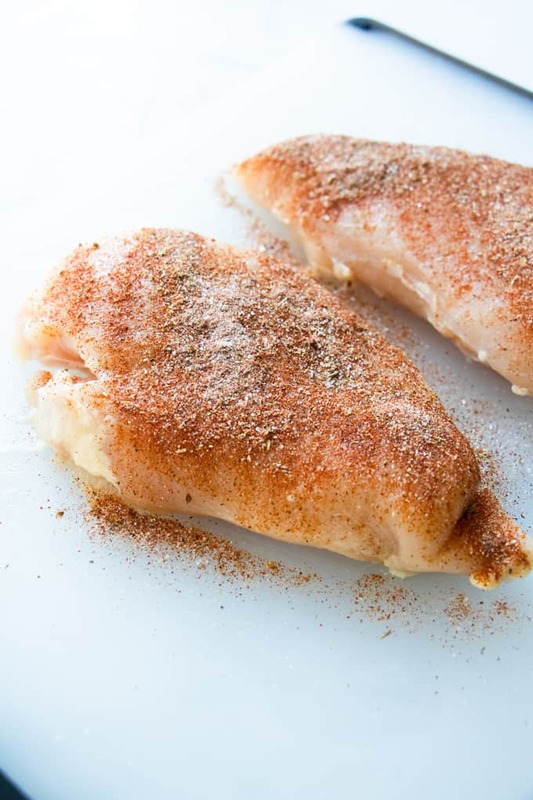 Mix up the chicken taco seasoning and coat the chicken breasts. Add the chicken to the slow cooker and add in the 1 cup of chicken stock. Don’t worry, it will be plenty, the chicken will create more juices as it cooks. Let this cook on low for 4 hours or high for 7-8 hours. Shred the chicken, then add back to the slow cooker to stir the chicken into the remaining sauce. This adds more flavor. Then you are all set to make your chicken tacos! 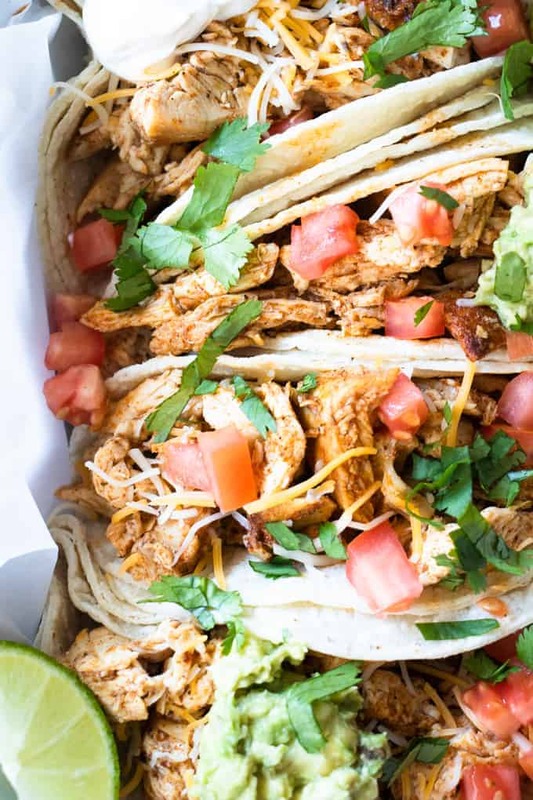 What is the best chicken for Chicken Tacos? I prefer to use boneless skinless chicken breasts for this recipe. It’s easy, and the method we are using to cook the chicken makes the chicken juicy. You can substitute with chicken thighs though for a mixture of dark and light meats. The method will stay the same. 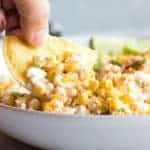 What toppings do I use for Chicken Tacos? 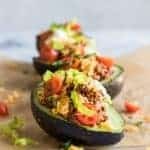 Guacamole- this recipe is super simple and comes together quickly. Pico de Gallo– basically a fresco salsa made with chunks of tomato, onion and jalapeño. 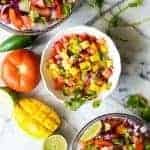 Homemade Salsa– a blended salsa that is perfect for pouring over any taco recipe! 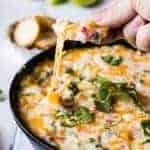 Cheese, Sour Cream, pickled jalapeños, diced cilantro, diced tomatoes, and lime juice. Basically anything else you want! 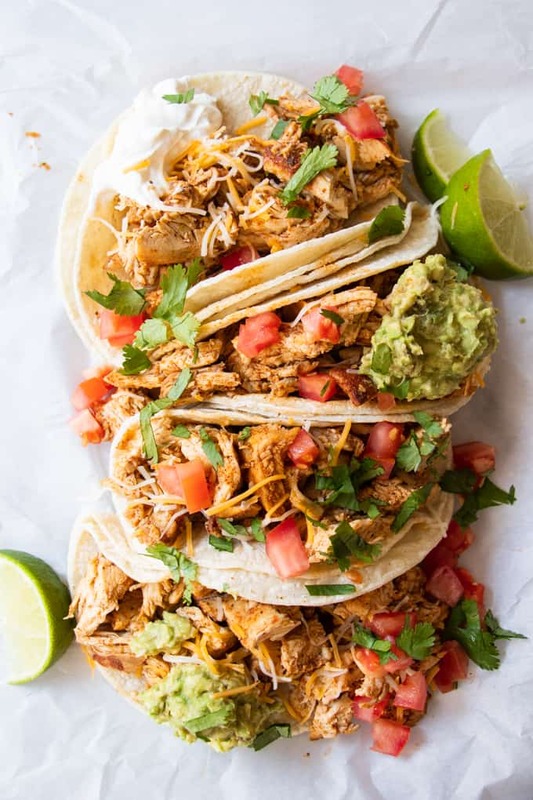 WANT TO TRY THESE 30 MINUTE CHICKEN TACOS? Serve warm on tortillas with any additional toppings you would enjoy! Nutrition Information is for the shredded Mexican Chicken only. For accurate information calculate any tortillas and/or toppings you are using. When the lcjicken is covered with the lid, what heat setting should it be on? Keep the heat to a medium or medium low. You should see a simmering happening with the liquid, but you don’t want it to be aggressively boiling.